If this movie had said “naughty list” one more time… In my year end review of the best and worst films I’ve seen all year, my "worst of" is almost strictly big budget theatrical releases that had the means to do something more but squandered millions in the making of something unwatchable. Even though these “blockbusters” may not be the literal worst movies of the year, they had the means and no excuse for not being better. It’s rare I pick an independent film for worst of honors because lack of funds and having passion over experience often leads to projects you can see the promise behind if not the know-how or execution. The budget horror Elves from a first time filmmaker may still get my very worst of 2018. It’s an abomination of filmmaking. In low-budget filmmaking, acting, lighting and cinematography are often sacrificed due to knowledge or budget. While this hurts a film it’s never a death blow as good storytelling, dialogue or just a fun movie or original concept can do a lot. Lighting in Elves isn’t professional but isn’t bad. Cinematography is often misplaced. A particular car scene with a handheld cam and a fourth of your screen showing the backseat of the driver comes to mind. Sound quality is actually better than a lot of budget films but at times the quick dialogue was hard to follow due to poor sound. Acting isn’t good but I can’t comment further on the actors because the dialogue given to them to work with is even worse. Repetitive verbiage like “Be naughty, have a drink” made me want to stick a carving fork in my ear via the worst CGI possible. The film’s name and Christmas themed score are the only things loosely connecting this feature to the holidays. A sleek cover that has little to do with the actual movie and a well-chosen trailer disguise this as a better feature than it is which is the real sin here. All the better to get your money with my dear. The very non-Christmas themed Elves uses being self-aware as an excuse to rip off the wide smiles of Blumhouse’s Truth or Dare with glitchy CGI effects better fitting Snapchat filters than anything that should be in cinema. In fact the entire concept and “campfire” friend gathering is blatantly ripped off from Truth or Dare. The only difference is they call their ancient evil an elf and try to pass this off as a Christmas movie. There's not telling which movie was written first but less than a year from the previous films release there's no excuse for the CGI smiles. At least they didn’t take the name Truth or Dare as there’s already enough horror movies with that title in existence. 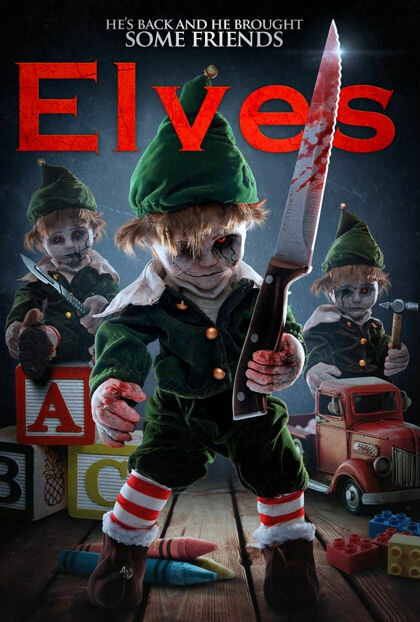 Last year Pikchure Zero productions released “The Elf” from B-Movie writer, director Justin Price. I’m typically hard on Price’s CGI heavy films but the more practical Elf was one I liked better. If the Jamaal Burden directed Elves from Pikchure Zero is any kind of sequel to The Elf it’s an abstract sequel at best. The short hour and twenty minute runtime of Elves is at least thirty minutes too long. An excess of characters isn’t needed only making the stolen story convoluted. They didn’t even have the ability to create fun kills for such a body count literally choking a character on a tiny gingerbread man cookie. Knowing film taste varies as much as films themselves, I do try to point out things people might enjoy and things they may not like about the movies I review. I liked the creepy doll elves even if they did appear out of nowhere without reason. I like the score but it went non-stop throughout the movie. The only people I can foresee possibly liking this are maybe those who like movies like The Room for being so bad it's good. Though I personally fail to see the good here.